It is very unusual to find something of the previous occupant when you moved into a new place but this woman, Miranda and her housemate found a letter from the previous occupant of the house asking them for just one favour. In the letter, she stated that there was a feral cat living in the yard and that this cat was born 12 years ago in the yard, presently has an injured paw and is scared to go near people but can be fed; the previous owners used to leave food and water for it. She also said in the letter that they even bought him a home for him to stay in during winter and the rainy season so he wouldn’t fall sick from exposure to the cold. 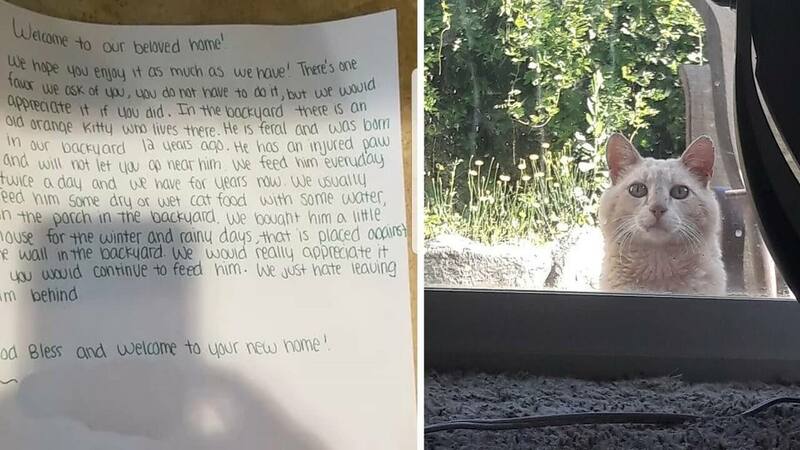 She also added in the letter that she would love for them to continue taking care of the cat. Watch the heartwarming video below!! !